0	0	Voice in the Night	In Stock - Order before 4pm for same day dispatchWant it on Wednesday 24 April? Want to see faith in action in Africa? Born into a long line of witch doctors, Surprise ("Surpresa") Sithole was destined for a life of fear, oppression, and poverty in the jungles of Africa. But at the age of fifteen, he was awakened in the middle of the night by an unfamiliar voice. Urgent, but not harsh, it told him to get up and leave his family immediately. As Surprise stepped out into the night, away from everything dear to him, he had no idea who God was - or what he had in store for him. From miraculous signs and wonders to supernatural deliverance from certain death to divine revivals that overtook countries, Surprise has followed wherever God has led, becoming an agent of hope and change in a continent devastated by war, poverty, and spiritual oppression. "Voice in the Night" is the amazing true story of what began that night in a jungle hut more than twenty-five years ago: a journey - an adventure - of faith and miracles. 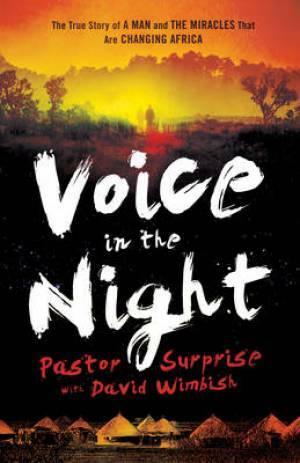 Voice in the Night by Surprise Sithole was published by Baker in March 2012 and is our 4625th best seller. The ISBN for Voice in the Night is 9780800795238. Pastor Surprise is a director of Rolland and Heidi Baker’s Iris Ministries, but his adventures with God began at the age of fifteen when an audible supernatural voice called him urgently to leave the Mozambique hut of his witch-doctor parents. It was the beginning of a ministry conducted against a backdrop of extreme poverty few Western people could comprehend, and now covers many African Countries and reaches out into Europe and America. His story is one of pure indomitable faith and very many wonderful miracles of Jesus juxtaposed against civil wars spawning some of the worst atrocities dreamt up by human beings. Indeed miracles are everyday occurrences for Surprise and his family and he believes the lack of them in the West is due to our ‘sophisticated’ questioning of everything we hear, including God’s Word, thus displeasing Him. ‘When simple people accept and believe what the Bible says without question, God blesses them,’ he says. ‘God reveals His mysteries to the simple-hearted.’ This is a book full of the joy of the Lord, showing how evangelism can be, and indeed is wherever Jesus takes this remarkably anointed servant of His. Take a peek at some articles related to Voice in the Night. Got a question? No problem! Just click here to ask us about Voice in the Night.